At the Florida RV SuperShow "Fun is Right Around the Corner"
RIVERVIEW, Fla., Dec. 30-- The Florida RV Trade Association (FRVTA) will host the 24th Annual 2009 Florida RV SuperShow, Wednesday, January 14 through Sunday, January 18. The Florida RV SuperShow will again be held at the Florida State Fairgrounds in Tampa, Florida. The 2009 SuperShow will break the record for both manufacturer's space and supplier's booth space. "We will have more Suppliers' booths than ever before and a record amount of Manufacturer space," said Marketing Director David Kelly. "With the addition of new entertainment and more seminars, we're anticipating record crowds this year. We're also renewing the 2-day pass so the public will have two full days to see everything at the SuperShow at no additional cost." The theme of the 2009 Florida RV SuperShow is "Fun is Right Around the Corner". With more families looking into RVing as a travel option and trying to stay closer to home, "Fun is Right Around the Corner," seemed like an appropriate theme for the 2009 SuperShow. With a record amount of RVs on display and educational seminars, the SuperShow is the place to trade-in your old RV or get all the information you need to get acquainted with the RV lifestyle. And some of Florida's finest campgrounds and resorts will have booth exhibits to show attendees the best camping opportunities found anywhere. A favorite of all visitors to the SuperShow is the FREE entertainment. From clowns and unicycle riders to Barbershop Quartets and BagPipe Bands, the SuperShow has enough entertainment to keep everyone busy the entire day. New to the SuperShow this year is the Arneberg's Super Dog Show with tricks and surprises. And take advantage of the FREE shuttle service inside the SuperShow that will carry visitors from exhibit to exhibit. Seminars are presented throughout the day at the SuperShow making it easy to attend the ones you want to see. National RV Writer Bob Marx hosts two seminars daily. 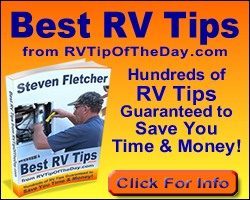 "Choosing an RV; A Logical Approach" helps you decide which RV is right for your particular lifestyle and "Full Time & Extended RV Travel" explains how RV travelers deal with banking, bill paying, telephone communications, e-mail, mail forwarding, medical care and other concerns while on the road for extended periods of time. Other daily seminars include John Holod Productions presentation of "Alaska RV Adventure: Highway and Ferry," "RV Adventures to the Gulf Coast and Baja Mexico" and "East Coast RV Adventure: Maine to Key West." The Super Rally celebrates its 19th year at the SuperShow. This RV rally is opened to any and all RV clubs and the general public and includes a number of amenities including FREE admission to the SuperShow all five public days, meeting facilities for your club, FREE coffee and donuts every morning and seminars. Three nights of entertainment and refreshments are also included and will feature "A Song in My Heart" music by Kay and Ron Rivoli and a fun evening with Rick Arnold's One-man Show and great brass music and comedy with the Music City Brass. See the "World's Largest" RV Sand Sculpture, and Camping World will have a huge display of parts and accessories. The F.L.O.W. Mobile will be on-site from the Florida Driver's License Bureau for all your Florida Driver's License needs. New this year is Brian Brawdy with his "Green" RV display. The Green RV uses six solar panels and a wind turbine. It also captures and stores rainwater for use later as fresh, sanitary water. The RV has everything found in today's homes: complete kitchen, queen-sized bed, full bath and entertainment center. It even has walls that slide out at the touch of a button. At first glance, it may seem RVing is hard on the environment. "It's not," says Brawdy. "I'm sharing my Green RV to make this point." Brawdy also says that he already sees other RVers at local campgrounds doing a big part to conserve water and electricity, recycle and buy paper items over plastic. "We can all do a little more. And a little from all of us is all it takes," says Brawdy. Brawdy, 47, grew up in Syracuse, N.Y., where he was a police officer for nine years. Referred to as an 'Outdoor Adventure Expert,' "Environmental Pioneer' and 'Eco-RVer' he has inspired audiences during appearances on Good Morning America, Fox News, CNN, CBS Early News, ABC, CBS and FOX. Admission to the SuperShow is only $8.00 for adults and that includes a second day admission for the cost of one day, and children under 16 are FREE. The SuperShow hours are Wednesday - Saturday 9 a.m. - 6 p.m. and Sunday 9 a.m. - 5 p.m. Wednesday is Senior Citizens Day with seniors receiving $1.00 off the cost of admission (not valid with other discounts). For more information on the 2009 Florida RV SuperShow contact the Florida RV Trade Association at 10510 Gibsonton Drive, Riverview, Florida 33569, (813) 741-0488, or visit our web-site at www.frvta.org.